You all know that when it comes to "trends," I'm hardly ever the first one to jump on board. It took me months to get on the slip-on wagon – but I'm oh-so-glad I did. For the most part, those trendy items are usually in-and-out, and I prefer to invest in classic pieces that I truly love and that I know will stand the test of time. Case in point: Birkenstocks. When did that even start? I feel like all the sudden everyone around me is sporting the '90s favorite -- and when I feel like everyone around me is wearing the same thing, that's usually what makes me back off from it. However, I actually think I might be coming around to these things. Maybe. Sort of. 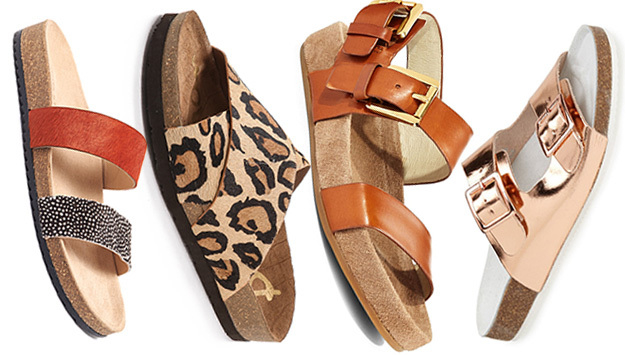 Here's what I know for sure: I really like Loeffler Randall's take on the style. It's definitely Birkenstock-esque, but more refined. You get the double-straps and the thick, cork sole of Birkenstock, but the materials are much more refined. I love the leather choices and the contrasting patterns and textures. The gold + cheetah stripes are definitely my favorite. They're basically a dressed-up Birkenstock, no? This is kind of Birk that I can definitely see taking up a spot in my closet.